Superfood Sweet Kale Salad with Roasted Lemony Chickpeas. 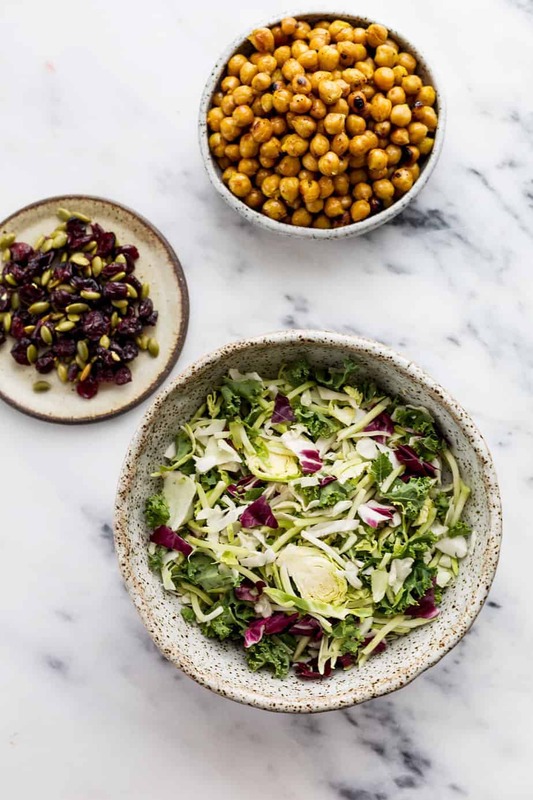 Ingredients of kale, green cabbage, broccoli, Brussels sprouts, chicory, roasted pumpkin seeds, dried cranberries with a creamy poppy seed dressing and a plant-based protein roasted lemony chickpeas. A light salad that’s unique and refreshing to eat with its different textures from the seeds, berries, greens and crispy chickpeas. The dressing compliments it perfectly without an overbearing taste, letting the flavors of everything else shine through. 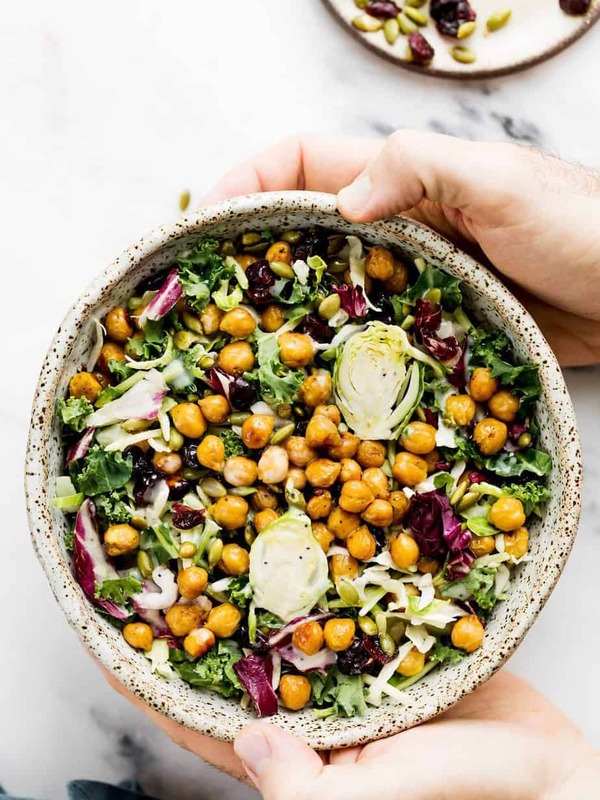 With the chickpeas (aka garbanzo beans) making the salad more filling and the different flavors involved I would consider this a full-meal salad that’s perfect for lunch or dinner. 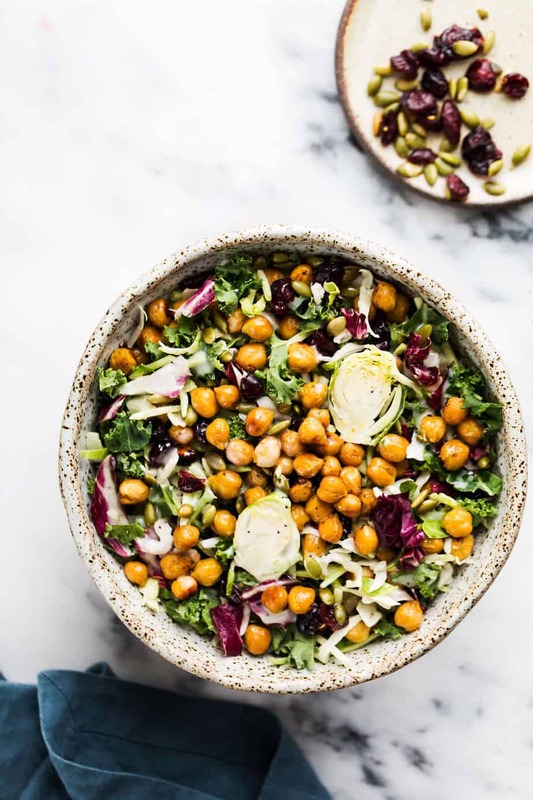 For those who are not fans of chickpeas, you could simply replace it with a protein like chicken, tofu or kidney beans while keeping the other salad ingredients the same. This salad was a snap to assemble, with almost all of its contents coming from an Eat Smart Gourmet Sweet Kale Salad Kit. It’s the tastiest kit I’ve found with kale, broccoli, Brussels sprouts, green cabbage, chicory, pumpkin seeds, cranberries, and the dressing. I’m a huge salad person but the likeliness of me bringing all of those together on my own isn’t likely. 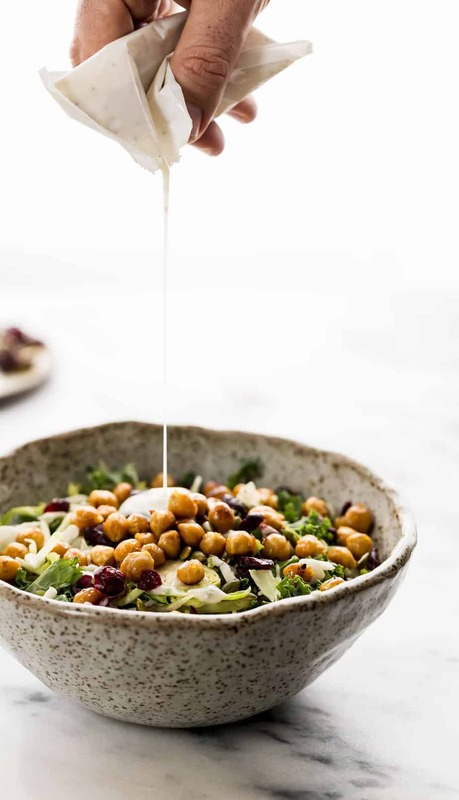 I just added my chickpeas (see recipe below) and I was off to the races with a tasty salad that boosts my intake on healthy vegetables and brings a high fiber meal with tons of flavor and variety. 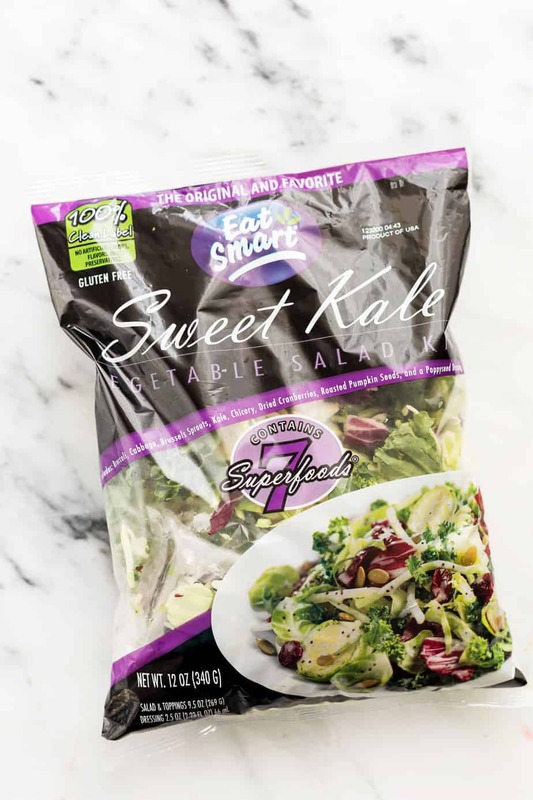 One reason I was excited to work with the Eat Smart brand is that this salad kit is 100% Clean Label, which means no artificial colors, flavors or preservatives. All of the Eat Smart products will have Clean Labels by the end of 2018. This is so important to me as a mom of two young kids and a husband who rely on me to make wise food decisions. With a busy schedule, I absolutely love being able to simply tear open this bag and have a fresh salad ready to eat, whether that’s for my husband to bring to work or for the whole family to enjoy after the usual kids afternoon of sports and other activities. I try to keep my family eating healthy foods by filling up my refrigerator with fresh vegetables, but notice they often want something that’s faster and just plain easier than things that entail peeling, chopping and dicing. Having a go-to salad kit that is both delicious and clean will really help out. Visit Eat Smart website and sign up for an email newsletter to receive updates and other promotions. I picked up the Eat Smart Kale Salad Kit at Walmart, where they are sold nationwide. I like that it really was a comprehensive salad on its own, but being me I always like to add more and get creative. Let me know what you think and please share any ideas you have for a salad based on this kale salad kit. In a mixing bowl: Combine garbanzo beans, lemon juice, cumin, coriander, agave nectar, lemon pepper, turmeric powder, salt/pepper to taste. Pre-heat the oven to 450F. Roast the garbanzo beans for 20 minutes. Let them cool for a few minutes, then add to a salad bowl with Eat Smart Sweet Kale Salad. I have fallen in love with this recipe! So delicious and healthy, packed with so many benefits. Oh that looks really tasty. I am really in the mood for salads right now. Sharing this one. Love this simple yet delicious recipe! The salad leaves look so fresh – sometimes it’s hard to get them fresh. This looks sooo Yummy!!! I love lemon flavors and this on my recipe list!! !